We are professional in producing the best quality and the most advanced infrared contact lenses which can read invisible ink marks well of marked playing cards. We have different contact lenses in different colors for different eyes. No matter what color your eyeball is, you can always find the right contact lenses here. 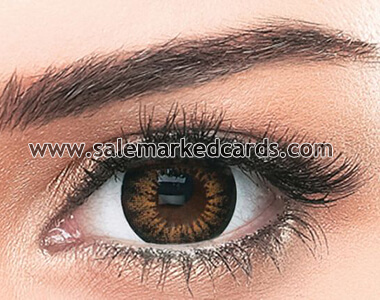 Infrared contact lenses for dark eyes is special for dark brown or black eyes and sees the infrared marked cards very well. This kind of contact lenses is suitable to people who has dark color eyes. It will not change the eyeball of dark color at all. Please note that the blue or green contact lenses isn't suit for dark color eyes and will make the eyes look strange. And what's more, professional ones is always the best ones, but not the cheap ones. For the eye health please remember not to wear any broken conatct lenses no matter how cheap it is. Always keep in mind that the one suit you is the best for you. And what you get will always much more than what you paid for one good pair of lenses.